The ontology for the Virtual Manufacturing (VM) domain captures all data concerning the representation and simulation of factories and is meant in particular to be a collector of shapes related to the discrete manufacturing domain. In particular, each VM element is associated with a Shape Group of the Shape Ontology that collects all its representations: in fact, more than one representation can be provided for each element. Be aware that the first provided one will be the shape group representative shape. The ontology exploits two standards for organizing the objects in the manufacturing domain: the IFC - Industry Foundation Classes and the DIN 8580 (Deutsches Institut für Normung) Standard. A categorization of the elements that can be created can be found in the following page of this tutorial. In particular, when creating a product the user can associate to it its working steps by selecting the processes its creation goes through. This leads to the creation of several shape groups, each one related to one of the product working steps, where the last corresponds to the whole product. A super group related to the product is created for collecting all the working steps groups. In particular, the VM ontology is based and imports two domain ontologies, the Pro2Evo (Product and Process Co-Evolution Management via Modular Pallet Configuration) and VFF (Virtual Factory Framework) ontologies, that are rather complex to be describe, so that also the VM ontology is complex to be described in details. Using the available interfaces, the user will be able to upload information on the elements without being involved in the complex process of instance creation in the ontology, that uses several relations and auxiliary instances. For complexity reasons, but mainly for copyright reasons due to its inter-connection with the two mentioned ontologies, a deeper description of the VM ontology cannot be provided. If a user is interested in downloading the VM ontology, this can be done only by previously downloading the Pro2Evo and VFF ontologies. Please, reference to Walter Terkaj to ask for the possibility of this and then contact the VVS administrators for asking for the VM ontology. Here, we provide the categorization of all the elements that can be created in the VM ontology and to which one or more shapes can be associated to. When either "Product" or "Production machinery and transport element" is chosen, information about processes related to the element can be optionally added, choosing among the provided ones. A categorization of the available processes is provided in the next page of this tutorial. 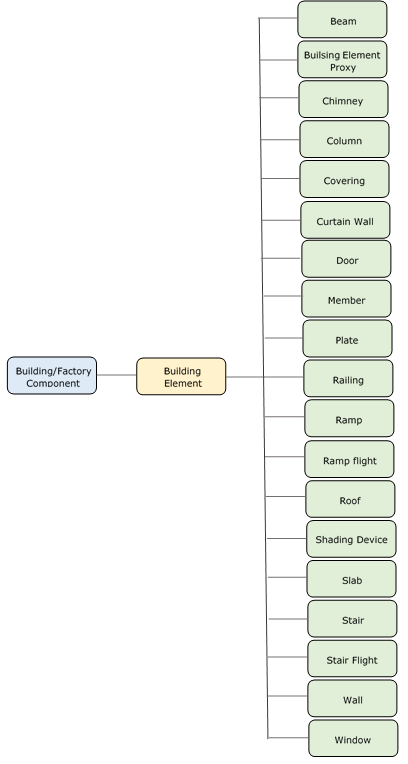 Here, we provide the categorization of the building elements, that due to its variety could not have been visualized in the objects hierarchy. 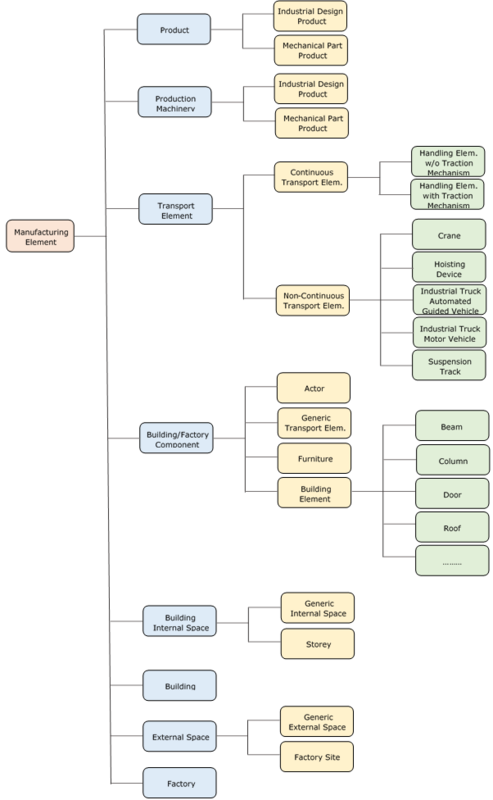 Here, we provide the categorization of the manufacturing processes that can be associated to a product or machinery within the VM ontology.